In a world of fantasy. "Daphne was another of those independent young huntresses who are met with so often in the mythological stories. She is said to have been Apollo's first love. It is not strange that she fled from him. Her father, the river god Peneus, was greatly tried because she refused all the young men who wooed her. But at last Apollo saw her, an everything ended for her. She was hunting. her dress short to the knee, her arms bare, her hair in wild disarray. She was enchantingly beautiful.Apollo thought, "What would she not look like properly dressed and with her hair nicely arranged?". The idea made the fire that was devouring his heart blaze up even more fiercely and he started off in pursuit. Daphne fled, and she was an excellent runner. Even Apollo for a few minutes was hard put to it to overtake her; still, of course, he soon gained. As he ran, he sent his voice ahead of him, entreating her, persuading her, reassuring her. "Do not fear," he called. "Stop and find out who I am, no rude rustic or shepherd. I am the Lord of Delphi, and I love you." But Daphne flew on,even more frightened than before. If Apollo indeed was following her, the case was hopeless, but she was determined to struggle t the very end. She felt his breath upon her neck, but there in front of her the trees opened and she saw her father's river. She screamed to him, "Help me! Father, help me!" At the words a dragging numbness came upon her, her feet seemed rooted in the earth. Bark was enclosing her, leaves were sprouting forth. She had been changed into a tree, a laurel. Apollo watched the transformation with dismay and grief. "O fairest of maidens, you are lost to me," he mourned. "But at least you shall be my tree. With your leaves my victors shall wreathe their bows. You shall have part in all my triumphs. Apollo and his laurel shall be joined together wherever songs are sung and stories are told." The beautiful shining-leaved tree seemed to nod its waving head as if in happy consent." I have always loved mythology and i'm glad to see it taking part in my passion. I saw strength, courage and freedom in Daphne's story, reminding me that women are strong enough to get through anything, staying independent and free. A woman should always know her strength, and know that she holds within her all it takes to live the most beautiful of lives. 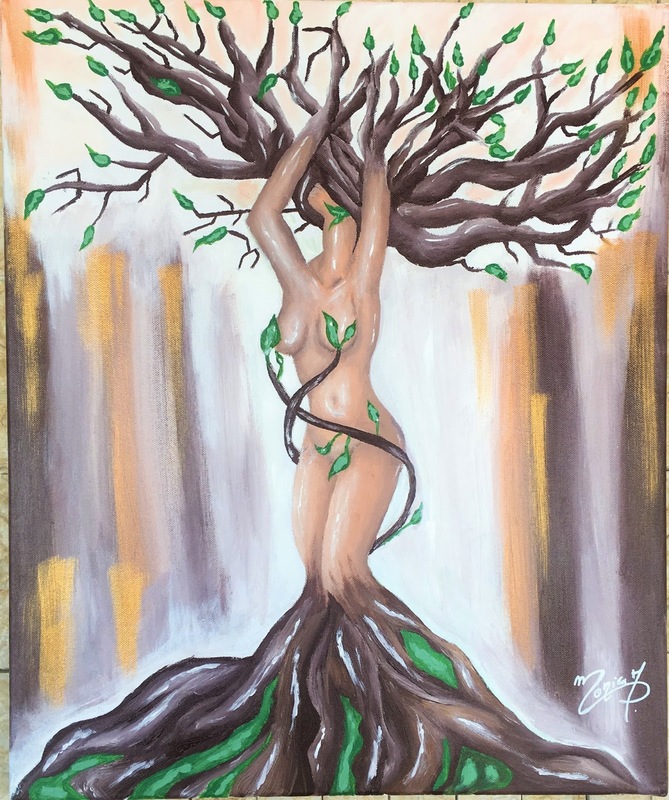 With the power of nature granted to her, her deep connection with the Earth and the world shown in this story through the tree, the woods and the river, and with her loved ones beside her, a woman holds the power of the world in her fierce heart. This beautiful wood nymph inspired me to bring her story to life the way I see it. Just why my head's not bowed. If interested in purchasing this painting, you can send me an email to monicaamogg@gmail.com, or DM me through Instagram. I am Monica, a Lebanese girl with a strong passion for art, in all of its possible forms. I have always loved to create, I have always believed I was created to create. I never liked to put my art under rules that are not my own, I believe art should not be defined or put under conditions and limits. My passion for art started since a young age, always looking for a pencil and a paper to express myself; and that is how I watched my art grow, jumping from style to style, from medium to medium until I believed I found myself in my creations. Painting is such a liberating experience to me, it has become an essential part of my life. I find peace in the crazy flow of colors, and in the endless hours spent in a different world, mixing and messing with paint to express thoughts and emotions. And I hope that you too, will find peace in my art, and it will touch you deep within.